Infolinks is the second best advertising network after Google Adsense. It’s a global advertising network, which allows advertisers to run their ad campaigns and allow publishers to earn money with blogs or websites by showing Infolinks ads. Infolinks ad network is different from most of the advertising network for many reasons. It doesn’t show ads like Google Adsense does. Also you don’t need to copy ad code to your website every time to show ads. Just copy ad code once to your website and it will start showing ads on your website in the format you want. As an Infolinks publisher you can change ads format and style by just making changes in your Infolinks account. It shows ads based on content and search history. Infolinks pays you based on CPC (Cost Per Click) and CPM (Cost Per Thousand Impressions). Your earning depends on clicks made by your website visitors and ad impression on your website. And Infolinks also gives you an opportunity to earn money by referring Advertisers and Publishers to Infolinks by its referral programs. Infolinks has different ad formats for publishers to use. As a publisher it depends on you where you want to show ads and which types of ads you want. InText is the most popular ad type by Infolinks. It creates links in your content to third party websites. InText ads are the best for showing content based ads on your website. It creates links to third party on relevant text or keywords, this can increase the clicking rate on your ads. InFold is my favorite ad type. I like the way Infolinks show this type of ads on my website. I don’t have to specify the space for the ad in my main website section. In Fold ad just pops up at the bottom middle of my computer screen and if I don’t like the ad I just have to click the close button. And the ad disappears. InFrame is also similar like InFold ad, but the difference between these two types of ad is the position of displaying. InFrame will show the ads on the left and right sides of your computer screen. InFrame ads can do better for you if you have blank space on both right and left sides. But if you have a full width website design then I’ll not recommend InFrame ads for you. InScreen another ad type by Infolinks, these types of ads will show in the middle of the screen and lock the content for the user until user will close the ad manually. I personally didn’t used InScreen ads on my website. If you like InScreen ads you can give a try to it. InTag ads are better to use in the bottom and the top of the content. InTag ads show a list of tags containing links to third party. User can check out the image ads for those links by hover on the hypertext. Applying for Infolinks is really easy and getting website approval isn’t hard like applying for Google Adsense is. The only reason Infolinks will not approve your website is if your website is in a different language than English (Till Feb 2016). Yes, they are working on it. We can see websites from different languages using Infolinks in future. If your website is in English, have a good amount of content and traffic you will easily get approval. To apply for Infolinks sign up on their website and fill your website url and other details and apply. They will send you an email once website will be approved. Sign Up For Infolinks Advertising Network here. How to add Infolinks ads to website? There are two ways to add Infolinks ads to your website. First one is by adding script code to your website code. And another one is by selecting your CMS first and then follows the steps that Infolinks give you. If you are managing your website under WordPress then you can add a plugin to your website and plugin will do the rest for you. Or if you know basic coding then you can add script code to your website. After adding the code you just need to select the ad type for your website. And ads will start showing on your website in the selected format. Do let me know what you think of Infolinks and your views about it in comment section below. Great Review of Infolinks, but I have some question in my mind regarding Infolinks. As I am looking for a secondary way to monetize my website, Does Infolinks do well with Adsense? And also, my majority traffic is Indian, will Infolinks pay good for Indian traffic? Urgently want 2nd monetizing method as Adsense is not doing good with Indian traffic, also the CTR is low. 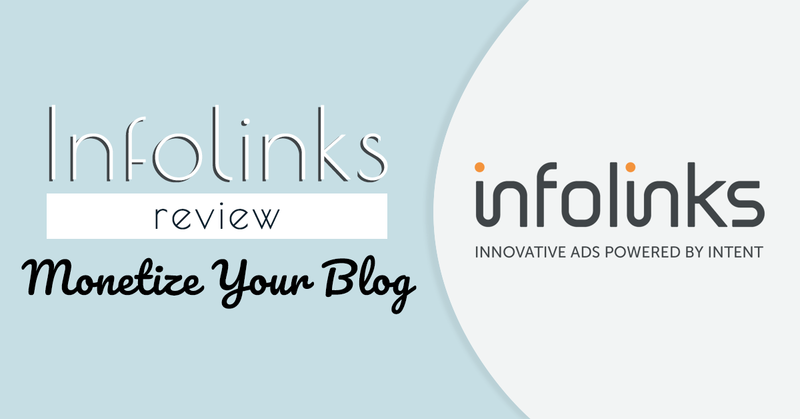 Infolinks is the best alternative for adsnese. It’s not better than adsense but yes Infolinks can help you increase your site’s revenue with adsense. You have to place your ads wisely to increase your CTR. Whether Infolinks works well with sports blog? as I am a sports journalist and now, started few sports blogs. If yes, then, How much I will be able to earn? InfoLinks is one of the best alternative right now for Adsense 🙂 The earning depends on your website traffic and the position/placement of ads. If you have good amount of traffic, Infolinks can help you to increase your earning.